and distributed to library patrons during the fall of 1977. For as long as I can remember, I have always loved to read. 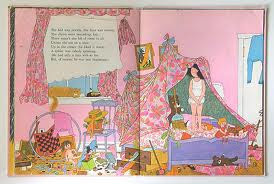 I was the classic "kid under the blanket, reading with a flashlight" 'til the wee hours of the morning. To this day, I am still a total bookworm. As I knew at 7 years old in the 2nd grade and as I know now, a book really is a friend. Have you ever experienced that distinct pang of loneliness after finishing a really good one? It's probably a combination of how deeply you identified with the story and the quality of time and space the book filled in your waking life. Sometimes it's the author's voice, or the colorful characters and their interesting lives. Other times, it's just the rich act of reading: being deeply focused on the written word, your imagination fully engaged. Whatever the reason, the story ultimately merges with yours, and in a way, forms parallell emotions and memories. When the last page is turned and the author's voice is silenced, there can be, most certainly, a palpable sense of loss. But a true friend never really leaves you. My favorite childhood books seem to still be with me, in me. The powerful words and imagery still live in my heart, even after all these years and countless numbers of books. With great recall I could recite you lines from the stories, and vividly describe the illustrator's drawings. Even down to distinct style and colors. As an artist, this has served me well over the years when designing children's rooms for my clients. There is a rich "library of memories" inside of me. Most of the books of my youth were borrowed from the library or passed down from me to my two younger sisters in succession. These "hand-me-down books" were either lost or discarded, worn out, or given away to other children. When I had my son it occurred to me that I really should start tracking down some of these books to share with him. Thanks to the internet and a little ingenuity I have slowly, but surely, re-built my collection of favorites over the past 10 years. I have new and wonderful memories wrapped around these lovely treasures! One of the most haunting and beloved books from my childhood. Was out of print at the time I purchased on Ebay for over $100. Growing up, I never owned this book. It was one that I checked out at the library, about 400 times. I was thrilled to have found it in 2005 as I was going through a challenging time of transition in my life. This "treat" was worth every penny. 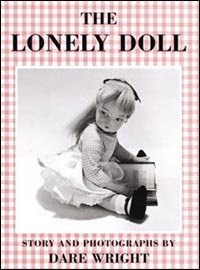 Throughout my childhood and even times as an adult, I really identified with The Lonely Doll, named Edith. So impressioned was I with this book, the Little Bear character in the story even made his way into my award-winning bookmark (see above)! For those of you who are familiar with this story, who could forget the artistic, haunting images of Dare Wright's black and white still photos? The little expressionless doll, apparently neglected in some anonymous, gloomy New York City mansion, was elegantly posed in true-to-life vignettes: eating breakfast, feeding pigeons, gazing out the window and wishing for friends to play with. Out of the blue two teddy bears, aptly named Mr. Bear and Little Bear, show up and the real fun begins. This haunting image has always remained with me. 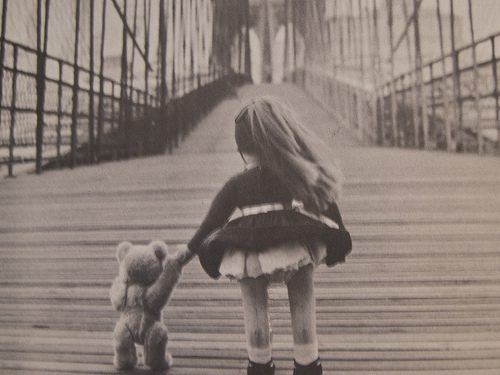 The Lonely Doll and Little Bear cross the Brooklyn Bridge. 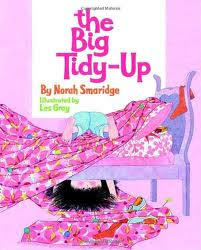 I heard that the book caused some controversy a few years back, when it was re-released, due to the "negative messages" it may send to little girls of today (the doll was "punished" for putting on lipstick and acting sassy, amongst other subjective actions). But it deserves respect for the time and place it was created and for the millions of little girls (now women) of a certain generation who adored it so. This may be one to appreciate for yourself and hide from your daughters! A lighter, more whimsical story, The Big Tidy Up by Norah Smaridge (copyright 1970), was also a dear favorite. Again, I never owned this book personally. It was one that was checked out of the library about 300 times. (As you can see, I really loved the library). I found this one on Alibris in 2007 for about $200. Yes, that is a lot of money. To cheer myself up during a sad and difficult time in my life, I splurged. It's cheaper than therapy! The book had been out of print for nearly 20 years and I hadn't seen it in about 30, but it still had some potent magic in it. The day it arrived was a really happy one! My sisters and I can all still quote, verbatim, at least half the book, beginning with: "Jennifer knew as well as you that everything had it's place... but she didn't care a whit nor a bit, so her room was a real disgrace." Scene from Jennifer's disaster zone, before the "big tidy up" that the book is named for. since a.) it is a collector's item and b.) his room is too messy! I remember the Lonely Doll! There is a whole series of Edith books. You should try and find them, too. Great memories, great posting! Oh, the Big Tidy Up! Why is it that I can recite this book by heart since childhood but can not remember what I did yesterday? Angela, is The Lonely Doll the reason that, to this day, I am afraid of dolls? ?